The whimsical hole-based puzzle game Donut County by Ben Esposito, creator of Tattletail among other works he helped with, has received a new trailer and a release date. This hole-y game will be arriving on August 28 for PC, Mac, iOS, and PlayStation 4. My first apartment in Los Angeles was basically run by raccoons. They were sleeping in the laundry machines, stealing pool floats, and howling from rooftops. The raccoons kept to themselves usually, so I wasn’t scared of them until one night when I heard a chittering sound from right above my head. I froze. Four feet away on the rooftop a raccoon stared at me, dead eyed, chewing on a battery. He was eating the battery. That was when I knew – raccoons cannot be stopped. 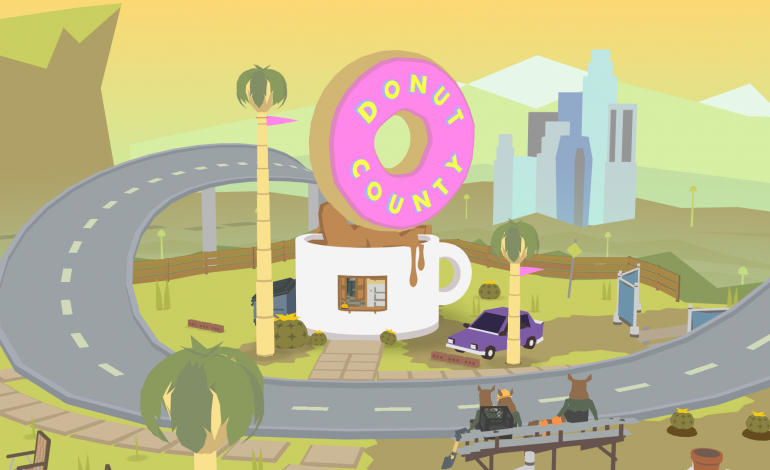 Until then, Donut County didn’t feel right – it was kind of cruel because you were playing as an evil force of nature: a creepy, destructive hole. Since you played as the villain I knew I needed a character who was dumb and wanted to steal people’s trash. It was staring me right in the face. Chewing on a D battery. Donut County will release for PC and Mac via Steam and GOG, PlayStation 4, and iOS August 28. It will cost $12.99 on all platforms, except for the iOS Store, where it will cost $4.99. You can preorder it on PS4 for $10.49 to get a special dynamic theme.